Edsel (The Monuments Men: Allied Heroes, Nazi Thieves, and the Greatest Treasure Hunt in History, 2009, etc.) continues his work chronicling the small band of artists and art historians who tracked down and saved Europe’s artistic heritage, this time focusing on Italy. During World War II, Hitler and Göring led the greatest looting operation of the 20th century. 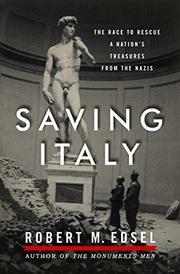 Nazi Germany justified its practice of absorbing art treasures of Western Europe and Russia as spoils of war—but Italy was an ally. After the destruction of Naples by the fleeing Germans, the leader of the Kunstschutz, the “art protection” unit, was ordered to Italy to guard her works of art. Instead, art was removed from carefully arranged hiding places in the countryside and taken to the north for “protection.” The author focuses on the work of art professor Dean Keller and art historian Fred Hartt of the American Monuments, Fine Arts and Archives section. These two men, who had overwhelming passion for Italy and her enormous artistic heritage, chased into cities before the fires of war had barely cooled, designating which areas were to be protected until secured. It was only through Keller’s work with a team of army engineers, fresco specialists and Italian military that we are able today to see the frescoes of Pisa’s Camposanto, blown off the walls by Allied bombs. Both men worked their way up the peninsula from Sicily, but their concentration was in Tuscany. Curiously enough, they were aided by Gen. Karl Wolff, the SS leader in Italy—whether it was his love of art or self-protection as the end of the war loomed is a matter for debate. Edsel’s knowledge and appreciation of art amplifies this celebration of the unheralded group of men who ensured the safety of Italy’s greatest treasures.